Jan 17,2012 SHOPlink -antech gets Par Excellance award at Project competition 2012. Team antech Anant Tikone along with Naveed Shaikh and Shankar Kurhade presented a paper on Productivity Improvement with Shoplink OEE Monitor. This competition named “Productivity improvement Project competition 2012” was organized at ICC convention centre MCCI, Pune on Jan 17th 2012, by Poona Divisional Productivity council. More than 40 teams from various industries presented their papers. 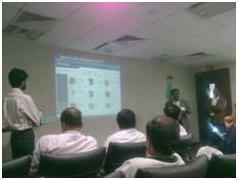 Some of them were from SKF, Tata motors, Volkswagen, Kimberly, Uni automation and Minda. Most of the industry persons appreciated the concept. SHOPlink paper presentation from Team antech gets Par Excellence award in this competition. Team antech is seen in photo with Dr.Shejwalkar, President Mr.khadse, Executive Director Core team of PDPC, along with Anant, Rohit and Naveed from antech. SHOPlink is a system to be used in high-tech CNC shops for monitoring OEE. SHOPlink allows quick information flow in MFG units making productivity improvements. Antech-Pune is leader in providing CAD CAM DNC systems and has more than 1600 installations in India and abroad. Visit www.antechmicro.com for more information.